Arnold Schwarzenegger is displaying formidable fund-raising skills as speculation mounts he is planning to make a bid to replace Gov. Gray Davis in a recall campaign. 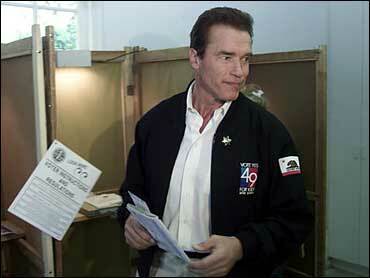 In twin "Terminator 3" events last month, Schwarzenegger used his star power to help raise $421,000 to erase campaign debts from an after-school programs initiative he championed, records show. Political analysts say the feat could serve him well if he decides to run for Davis' job. "If there were a looming campaign debt, that might be a distraction from a gubernatorial campaign. By settling the debt, he removes the distraction and demonstrates his fund-raising ability," said John Pitney, a government professor at Claremont McKenna College. The $463,092 debt stems from an education initiative launched by Schwarzenegger called Citizens for After School Programs, Yes on Proposition 49, which pushed for state money for before- and after-school programs. Voters approved the initiative in November. Groups pushing to oust Davis say they've turned in 1.6 million signatures from recall petitions, almost twice the number necessary, and are hoping officials will certify a fall election as early as next week. George Gorton, Schwarzenegger's political adviser and the campaign manager of his education initiative, said none of the money collected at last month's two "Terminator 3" fund-raising premieres will go to the recall effort or a potential Schwarzenegger campaign. But Gorton said he is pleased Schwarzenegger can raise buckets of cash almost overnight. "I've never seen so many people anxious to give money," Gorton said. The take, campaign contribution, records show, was $202,981 on June 25 and $218,750 on June 27. The total is enough to pay off most of the debt owed a pollster, an attorney and Gorton himself. If there is money left over from the premieres, or if more money is raised, it could go to repay an additional $450,000 Schwarzenegger loaned the campaign, said Gorton. Schwarzenegger came in second among five possible Davis opponents in a poll released Wednesday, with 15 percent of respondents saying they'd back the actor if the governor were recalled. Former Los Angeles Mayor Richard Riordan finished the strongest with 21 percent.